Fresh fruit and gourmet flavors. Send the delicious gift of orchard-fresh fruit combined with an assortment of gourmet delicacies. 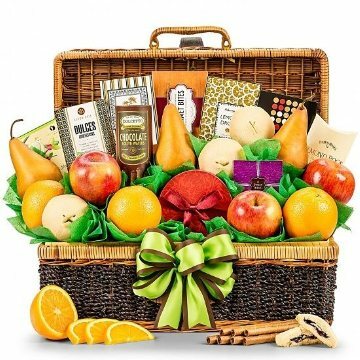 This picnic-style hamper is packed with premium fruit -- fresh Fuji Apples, Bosc Pears, and Navel Oranges -- and a banquet of treats! This hamper includes the following: Almond Roca - .82 oz, Dolcetto Chocolate Wafers - 3 oz, Hard Candy Fruit Rods - .13 oz ea, Jordan Almonds - 4 oz, Marionberry Filled Cookie - Three included, 2 oz each, Old Fashioned Lemon Drops - 4 oz, Premium Grade Pears - Three included, Tropical Island Mix - 2 oz, California Navel Orange - Three included, Gourmet Candy Pebbles - 4 oz, Hi-Energy Trail Mix - 4 oz, Northwest Fuji Apples - Three included, Peach Candy Slices - 5 oz, Snickerdoodle Cookies - 2 oz. If any substitutions are necessary, they will be made with items of equal or greater value. Measures 18" x 12" x 7"